JEX Professional cleans, degreases and disinfects all washable floors. Leaves a good smell after application. Excellent degreasing power, leaves no traces, without rinsing. Eliminates more than 99.999% of the bacteria present; Perfume long duration fresh and natural evoking the scents of the regions of France. Disinfectant according to EN 1276 in pure use. 3% bactericide in 5 min on Staphylococcus aureus, Escherichia coli, Enterococcus Hirae. 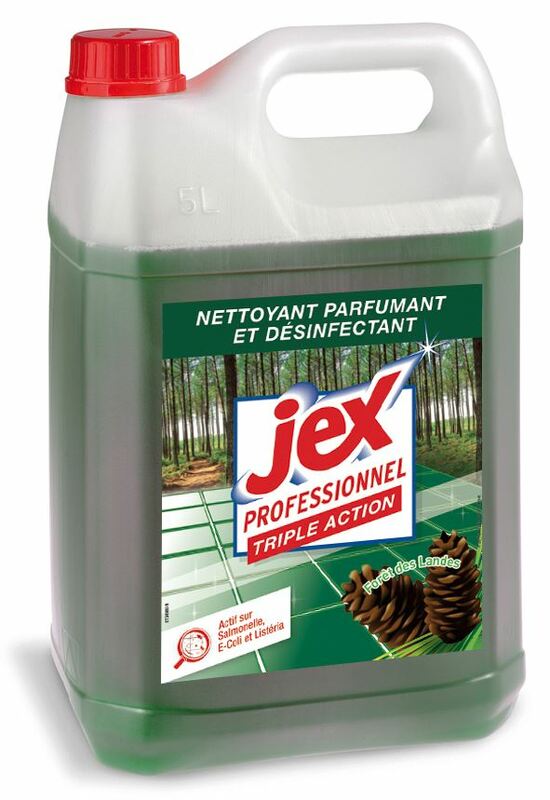 Enhanced efficacy: Jex Professional Triple Action is also effective on Salmonella and Listeria at 4% in 5 min. Disinfection tests carried out on previously cleaned surfaces. ** Rinse with potable water for any surfaces that may come in contact with food. *** Conforms to the regulations in force concerning cleaning products which may be in contact with foodstuffs. - Can be used without rinsing ** on all washable surfaces. - Nonionic surfactants: less than 5%. - Cationic surfactants: less than 5%. - Environmental information: guaranteed without ammonia, 100% recyclable bottle. très efficace...mieux que ceux du commerce..
Laisse une odeur agréable et une propreté impécable.